This was also originally published on Teentoday.co.uk, which has since fallen down a giant snarky-pop-writing consuming Internet manhole (RIP). So I wanted to post this here as I think it’s a pretty good interview if I do say so myself… and because Earth vs The Pipettes is holding up pretty well actually, as I listen to it whilst typing this very sentence! So are all the polka dot dresses burning on an incinerator somewhere? Ha! No, quite the opposite really… I’d say they were on ice for a little while. How is it working with your sister? Do you squabble over who gets the lead or are you over all that sibling rivalry? It’s really great working with my sister; we’re quite hard on each other sometimes but it’s great knowing you can really rely on someone. The trust is there naturally and we both want what’s best for the other and for the band. There is more chance we squabble over who has to carry the dresses than anything else… I usually end up carrying them! Pah! A couple of people are comparing you to Bananarama (partly their early sound, partly the line-up changes!). Is this a comparison you like/understand/are actively basing your sound on? We don’t mind that comparison at all. We’ve frequently referenced Stock, Aitken & Waterman when discussing our love of British pop music and so Bananarama sit nicely in there. The new sound and image for our second album was something that was discussed a good while before the band finished touring the first album. It’s an evolution that would have inevitably happened regardless of line-up changes. The Our Love Was Saved By Spacemen viral video was ermmm… interesting. What did you think of you with a moustache? Fanciable? Better interesting than boring, eh? We just wanted to give something that was fun and a bit light-hearted to the fans that had hung in there while we got ourselves together over the past couple of years. 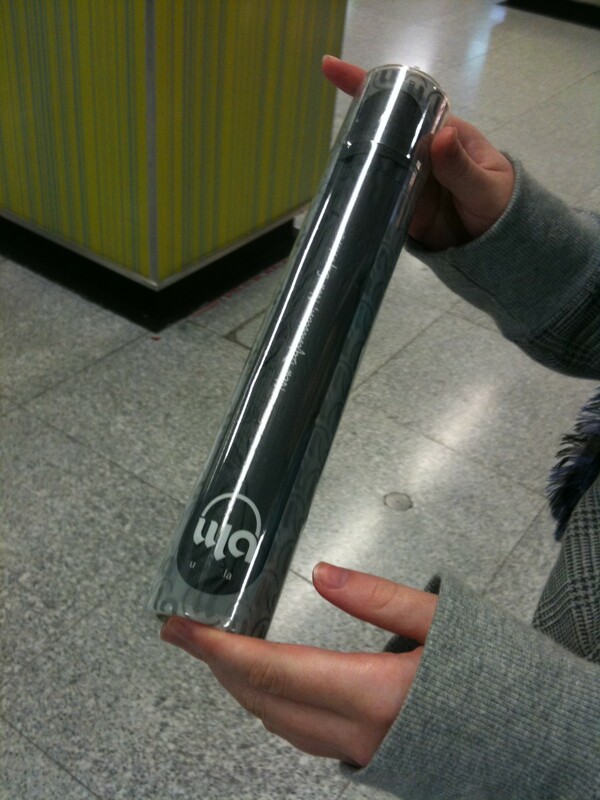 It was our Valentine’s Day gift to them; we actually didn’t realise so many people would see it! A cheeky moustache now and again never hurt anyone… why not! 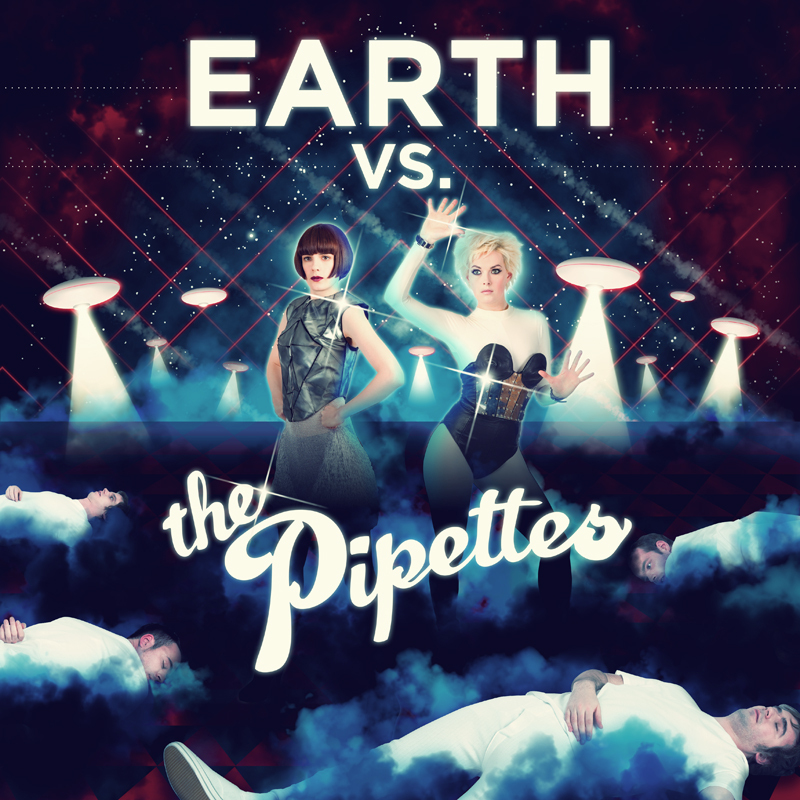 How would you describe the sound of Earth vs The Pipettes? Can you tell us about your favourite tracks? The sound on our new album is a lot more dance-oriented, a lot of disco beats in there. It’s fuller, it’s bigger and it’s a lot louder; a bit of an obnoxious cousin to the first record, it’s demanding to be heard. My favourite tracks change daily. There are certain ones I like to listen to and others I love to sing so it really depends. I do love From Today today and everyday. Who would win in a fight to the end in Earth vs The Pipettes then? Surely two girls taking on the whole planet is a bit much? What are your special moves? The Pipettes will win hands down! We just plan to brainwash everyone with our songs, simples. Since your single’s called Stop The Music, what music would you like to see stopped for good? Specifics please. I love pop music; I don’t love most of what’s on the radio BUT what I would say is that any bad music out there makes the good music oh-so-much better. There are so many talented people out there but most of the pop music we hear on the radio is written and produced by the same people. That’s why we’re so proud of our album – RedOne didn’t get anywhere near it! We’re pleased that even if you’ve dropped most of the influences from your first album, the Stop The Music vid sees you keep your propensity for the dance routine. Can we expect more classic Pipettes dances from the rest of the album? Will we get Youtube tutorials? Of course! We will never stop dancing, that would be criminal! We wouldn’t know what to do! You can, of course, expect more classic Pipettes dances, some spacey shakes and some other-worldy twists… all in the name of POP! The electro bandwagon – will The Pipettes be boarding or do you think the end for that sound is nigh? The only thing we’ll be boarding is our spaceship. Since the band was formed six years ago, we’ve done exactly what we’ve wanted musically and we’ll keep doing just that. We’re still in search of the perfect pop song and we’ll keep writing songs until we make it, synth or no synth. OK… we have to talk about the line-up changes (sorry!). Is Gwenno the scariest girl in pop since Keisha Buchanan or is she just misunderstood? Did you ever feel like jacking it all in? What made you decide to carry on? Things are never as they seem; I can’t talk for Keisha but it’s really not easy being in a band. You can work really really really hard for a long time and it can seem that there is no reward – it’s at this point that a lot of people decide to give up. We thought again and again about throwing in the towel but the only thing that kept us going was the belief we had in the songs we had made together. – Will The Saturdays ever be good? I thought their first album was very very good. – Will Girls Aloud get back together and if they don’t, will pop music that great ever be made again? I can’t really imagine them doing another album but it would be pretty incredible if they did, you never know. Xenomania are still churning out amazing British pop music and keeping the standard very high so there is a pretty good chance that we’ll have great pop music for a while to come. – Should the Sugababes carry on? I don’t see why not? About You Now was an amazing song and they could still have more amazing songs. – Would La Roux have been all-conquering if she hadn’t had “The Quiff”? Why of course. It’s a great and solid pop album but me oh my, that is one mighty quiff! – Any other music recommendations? Music Go Music, Fun., Lucky Soul and always go back and listen to the early Madonna records, sooo good! – Would you ever have auditioned for The X Factor? Could either of you have been Dorothy on Over The Rainbow? No no no to X Factor but I want to be Glinda or Toto please! And finally… Pull Shapes is an amazing song. That’s all really. I just wanted to thank you for bringing it into existence. Earth vs The Pipettes (what a ‘disco in space’ where ‘all the genres and styles that have set the dance floor going for the last fifty years were loaded onto a rocket and fired into the stars’ would sound like – a soundbite too good to be confined to a press release, methinks) is out now. 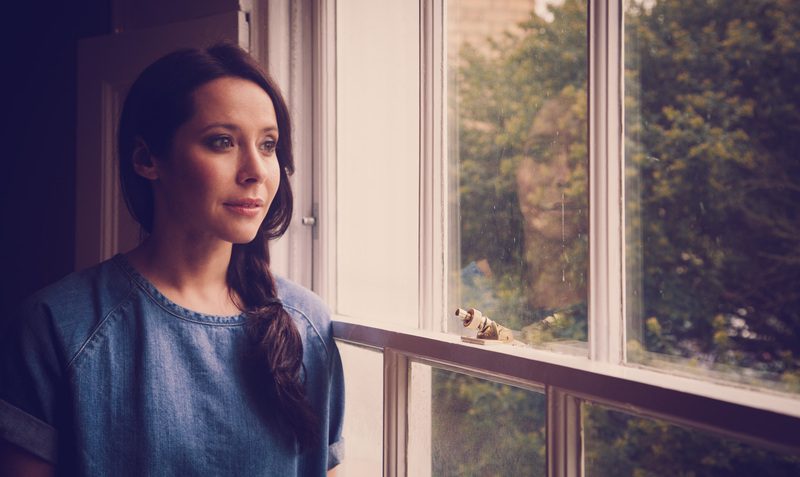 Here at Teentoday, we’ve been crossing our fingers for the day when Nerina Pallot makes it big so we can say we told you about her first. You know, like we did with Girls Can’t Catch, The Dolly Rockers and VV Brown… whadd’ya mean, who?! Anyway, in celebration of the recent release of Nerina’s really-rather-good single, Put Your Hands Up (which has received regular-blasting-out-of-speakers status at Teentoday Towers) and its parent album, Year Of The Wolf (nothing to do with Twilight), we had a little chat with the woman herself about all sorts of important matters. You know, like Cheryl Cole’s hair, the probability of her doing grime, Arsenal’s goalkeeper and mistakenly insinuating that she’s an old lady. Oops. We let her talk about serious stuff too, promise! We’re loving your new song Put Your Hands Up and the one-take dance-athon video… but how come you’re not busting out a few more dance moves here and there? We wanted to see your funky chicken! Nobody needs to see my funky chicken, let me tell you. Can you fill us in on what exactly was the ‘inappropriate content’ that got Put Your Hands Up taken off Youtube? Too much dancing? That’s right, it was too much of my funky chicken…. Um, no, basically Chris Moyles tweeted the link to the video and it went from a few hundred views to a few thousand in a matter of minutes, so YouTube thought something weird was going on. But it was Moyles. He broke my vid! Ha. Is it true that PYHU was originally written for Kylie? I wrote it with my husband around the time we were writing tracks for her last album and there is a track called Put Your Hands Up on that too which is where the confusion has happened I think. We love the PYHU Like It’s 1987 remix even more! Any chance of you giving some similarly poptastic remixes to some of your older stuff? Or doing the remixed version at live shows? Can you tell us more about the sound of your forthcoming album, Year Of The Wolf? How does it compare to your previous releases? It’s a little more reflective than my last album The Graduate, but also a bit more epic I think. Loads of strings, brass, all sorts. Any particular favourite tracks you can tell us about? I’m really pleased with the way Put Your Hands Up turned out, it was so much fun to record. There is another song on the album called Grace, which means a lot to me, and was recorded the night before my son was born. You dressed up as a rabbit for your last album, The Graduate. Can we expect to see a wolf costume this time? Any howling/Shakira gyrating in a cage antics up your sleeve? Everyone thought that I would be in a wolf costume on the cover. But no. It’s just me, with a hat on. Not very Shakira at all. You sing your own material yet also write for other people like Kylie Minogue and Diana Vickers. Is it hard to give up your songs or do you enjoy hearing other people’s interpretations of your lyrics? I feel really honoured when people choose to record my songs. I wrote them for as many people as possibly to hear them, so I never feel like I’m giving them up! Any good gossip on Kylie or Diana? You write and produce with your husband. How’s that feed into the work/life balance? Any blazing rows over the speakers? No, my other half Andy is the only person I can co-write with and not feel self-conscious. I read that you “struggle with the co-writing process” and have discarded lots of co-written songs in the past. How come? Because I felt like I wasn’t being honest or really myself with someone else in the room who I didn’t know really well. As a songwriter, you often go into a room with someone you barely know to do something that can be quite soul baring and emotional, and I seize up in those situations. It feels like you’ve always been “on the cusp” of being the next big thing. How did you get over things like being dropped from your record contract and “disappointing” chart positions, and carry on? I guess I’ve always done music for music’s sake – so I just keep making music regardless of whether it goes in the chart or not. That stuff has never motivated me – writing the best songs I possibly can does. You take a lot of cover requests via Twitter for your live streams. Are there any songs that you deem un-coverable? Can we hope for Nerina’s take on rap or grime? I wouldn’t know where to begin with Chipmunk. That kind of stuff just hurts my ears, it’s totally lost on me. And I like a lot of hip hop but it’s just nonsense to me. Nah. No grime covers from me any time soon. You’ve been “in the industry” for a long time now; what are your thoughts on the whole X Factor/Idol breeding ground of pop stars? After the whole Cheryl Cole fiasco, would you ever be a judge on these panel shows? I think it’s important that these shows exist. I think it’s unlikely we’re gonna get the next Prince or even Adele from one of them, but they’ve always existed. I just wish the music the artists released was a bit more creative and less predictable. Yeah, I can totally see myself as the new Cheryl Cole. I mean, come on, I’m worth it, aren’t I?! How do you balance the demands of being a pop star with having a baby? I don’t really think I’m a pop star and he comes first really, so it’s how do I fit everything in around him. Your son is called Wolfgang Amadeus. Surely, with a name like that, a career in pop stardom beckons? Is he showing any musical inclinations yet? Well, mad as it sounds, we just gave him that name ‘cos we loved it, not ‘cos we wanted him to be a musician, but… yes, he is already really into the music. 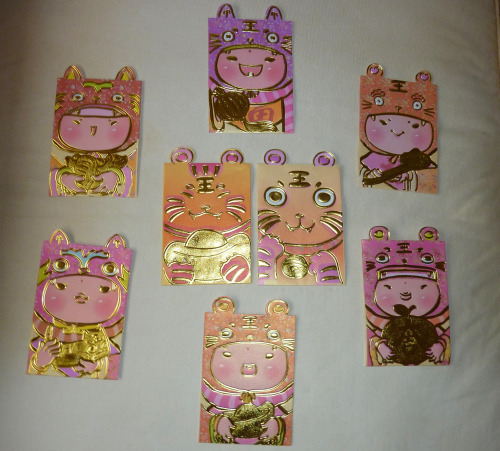 It’s quite scary! You’re a renowned Arsenal fan. As a girlfriend who is abandoned every weekend for the Arsenal game, can you give me any tips on how to improve my fandom? Are you also as stressed about Almunia [Arsenal’s crap goalkeeper who apparently ruins their chances every game] as my boyfriend is? The problem is, this Almunia stress has been going on for YEARS, and it shows no sign of going away, so your boyfriend might be a bit stressed for a while longer. If you’re still not sure about whether to go to a game, think about this: if you get decent seats, you get to see hot fit young men running around all sweaty, and depending where you’re sitting, you get to see them bending over a lot and taking their tops off. 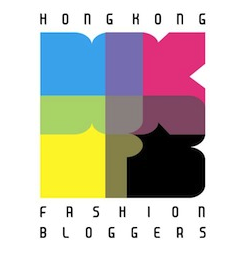 Believe me, it can really cheer a girl up on a rainy Saturday afternoon…. Are you saying I’m EIGHTY? IS THAT WHAT YOU’RE SAYING?! I was actually not the oldest person on my course actually so no, no bullying went on. Even though I realised the other day that I am old enough to be Justin Bieber’s mother, and that made me want a little lie-down. – Fave Spice Girl? Sporty – Mel C.
– Britney Spears: still got it or past it? Past it, which breaks my heart. – Cheryl Cole: nation’s sweetheart or bored already? A bit bemused by it in the first place. I mean, she beats people up in toilets. But she has lovely hair. – Fantasy X Factor judging line-up? Simon Cowell, Anne Robinson, Robbie Williams and Me. – Favourite Kylie era (Aphrodite bias nonwithstanding)? Confide in Me and the whole Kylie Minogue album era. Amazing. She should start wearing specs again, she looked incredible. – Lady Gaga: insanely awesome or getting a bit much? Aargh. Getting a bit much, but only just. – Biggest pop star crush? George Michael. I still haven’t quite come to terms with the fact that we won’t be settling down and raising kids and small animals together. – Tip for one to watch? Birdy, she’s got an amazing voice and is still about 8 years old or something. – Greatest musical inspiration? Kate Bush. If I’m old, she’s like your granny or something. 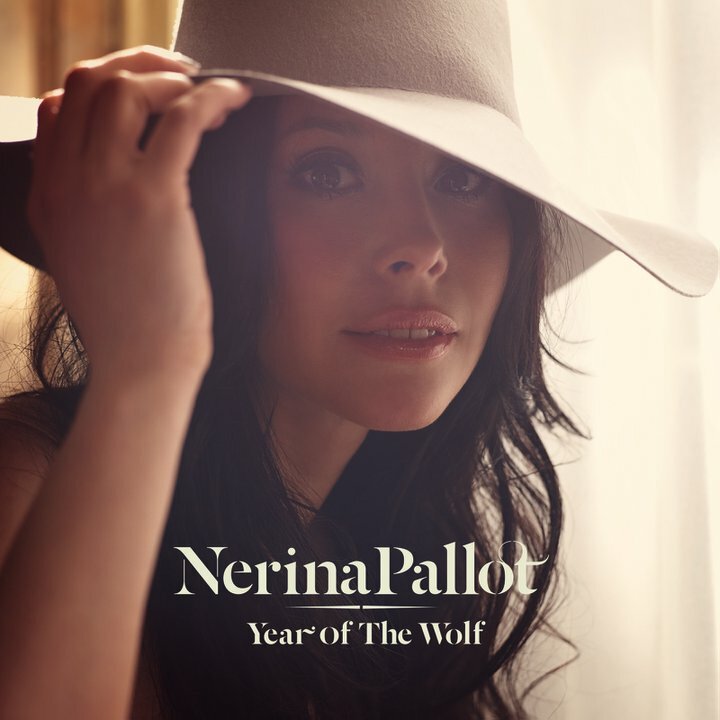 Nerina’s latest album, Year Of The Wolf, is out now. It’s quite good. Metaphors, similes, clichés – they’ve all been done before about Diana Vickers‘ “unique” voice and I really can’t be arsed to think of my own. Let’s just say that following her appearance on X Factor, I was firmly in the ‘strangled cat/baby in pain/nails down a blackboard/yodelling donkey’ camp and that was before I even noticed the crazed clutching action of The Claw™. So for me to be telling you that Diana Vickers’ album sampler (title: Songs From The Tainted Cherry Tree) is blow-me-away brilliant is quite something, right? Once – If you love this, I can safely say you’ll probably enjoy the rest of the sampler. This synthy, bleepy, breathy triumph was masterminded by Cathy Dennis (Can’t Get You Out Of My Head, Toxic, About You Now) and Eg White (Leave Right Now); the killer stomp of the chorus is proof that pop pedigree like that will always out. Remake Me And You – This is basically Once with its finger pressed firmly on the fast forward button. Frenzied and fantastic, it speeds by quicker than a boy-racer in a souped-up Volkswagen. The final strangulated ‘Yaaaaaaaaooooooooowwwww’ (translation: you) does remind you that this is a Diana Vickers record though. The Boy Who Murdered Love – This is basically Once with its finger idling on the slo-mo button. The chorus is insanely catchy (‘Shot shot shot shot shot like a bullet/Stop stop stop stop stop all your loving’), there’s a nice lyric about roses turning from red to black and a wonderful last ten seconds of pounding drums. The whole track has a nice heartbroken throb to it. My Hip – This song made me wonder if Vickers could be the UK’s answer to Shakira. There’s an exotic-sounding zesty brass segment set against Speedy Gonzales attacking the drum and bass, plus quirky lyrics (‘Your hand is back where it belongs/On my hip, on my hip!’) and the distinctive warbling llama voice. Now we just need Vickers to start comparing herself to a coffee machine with humble breasts and gyrate in a cage for the video for the transformation to be complete. Shakira comparisons apart, this song is breathtakingly awesome. If I had a press release for this album, this would be the title I’d be fluorescently-highlighting and drawing asterisks around manically. Article also available at Teentoday. 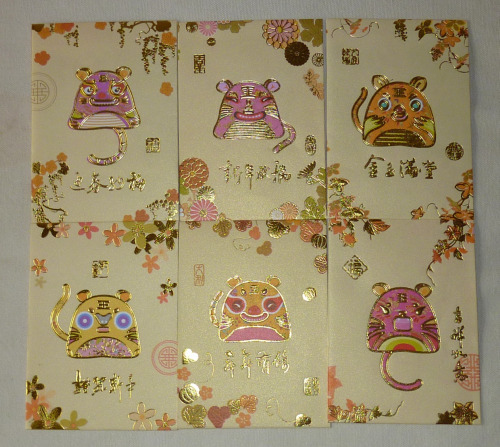 Another Chinese custom (yes, keep up, there are many) is to have fresh flowers in the house at CNY for good luck. 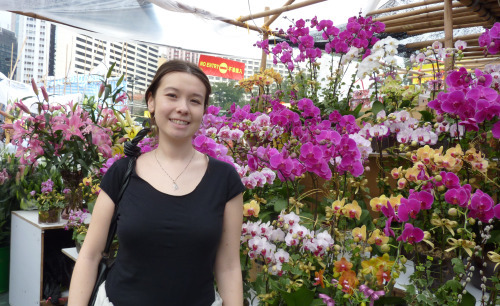 Every year, there is a big Flower Market in Victoria Park in Causeway Bay for you to purchase your flowers at ridiculously over-inflated prices but it’s become almost as much of a tradition to take a spin round here for luck as it is to have fresh flowers in the first place. And it is spectacular to visit – the perfume of all those blooms is just amazing (indescribable – you have to experience it first-hand) and the flowers themselves…! Wow! 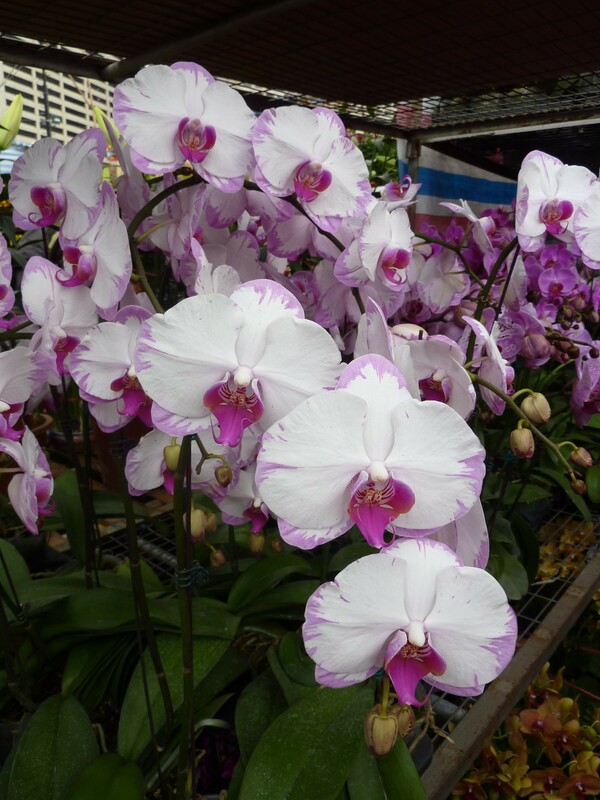 Forget the Chelsea Flower Show, there’s nothing quite like seeing the most beautiful perfection of orchids, lilies and gladioli in a rainbow of colours accompanied by squawking Chinese hawkers yelling ‘Good price, lang mui, good price!’ with the smell of curry fish balls hanging acridly in the air. Nowadays, you’ll find as much CNY tat (giant inflatables, cuddly toys and costumes of whichever animal’s year it is) and dubious street food as you will fresh flowers, yet that’s all part of the appeal. Last year, my auntie and I discovered a stall selling deep-fried ice cream on sticks. We started with one to share between us to try – and five each later, we were hooked. I barely remember if we bought any flowers that year… but alas, battered ice-cream wasn’t there to distract us this time. 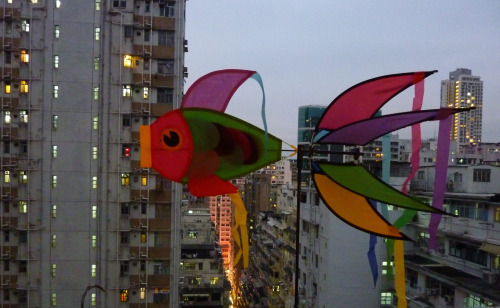 Novelty windmills also appear to be lucky judging by their prominence at both the fair and the stalls around Chinese temples; we bought this very pretty ribbon-y fish one (pictured installed on our balcony). We’re savvy sorts so we didn’t actually buy any flowers from here, merely “got inspiration” before getting them cheap at our local wet market. Buying fresh flowers always seems such a silly idea as they’re dead almost before they’re alive but they really do look gorgeous and bring you some sort of unique special feeling and pleasure. 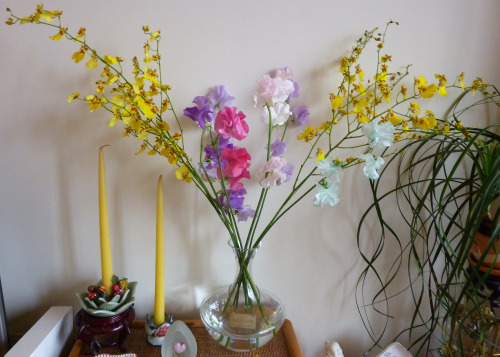 These sweet peas were my choice, as they were never strong enough to survive the hardships of British weather in my garden at home. I guess a garden is one of the few things I miss about home – but I never had to look after it did I?! Perhaps the life span of fresh flowers is just about right for my current level of responsibility-taking. Me: Should I bring my umbrella, Richard? Ta-Dah! 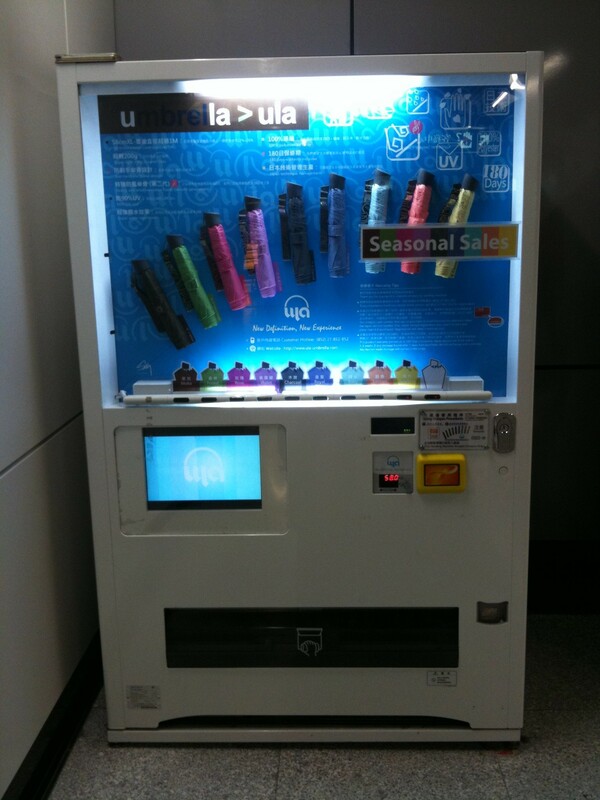 Umbrella vending machine – cute, right? Well it would have been cuter in the ice blue or the pink yet boyfriend was in charge of the purse strings and he wanted to assert his masculinity by opting for black. It comes in some pretty sleek packaging and even has a 180-day warranty (but to whom do you return it – the vending machine genie?! ).